A federal judge in Austin yesterday struck down part of a new Texas law that imposes tough health regulations on abortion providers, just one day before they were set to take effect. This scenario is one that is playing out around the country, as abortion opponents have pushed new restrictions through state legislatures and abortion-rights supporters have challenged them (often successfully) in court. The action in Texas now moves to the U.S. 5th Circuit Court of Appeals, which will review the ruling in the coming months. For now, however, a substantial part of the Texas law has been ruled unconstitutional and is on hold, pending the outcome of the appeal. 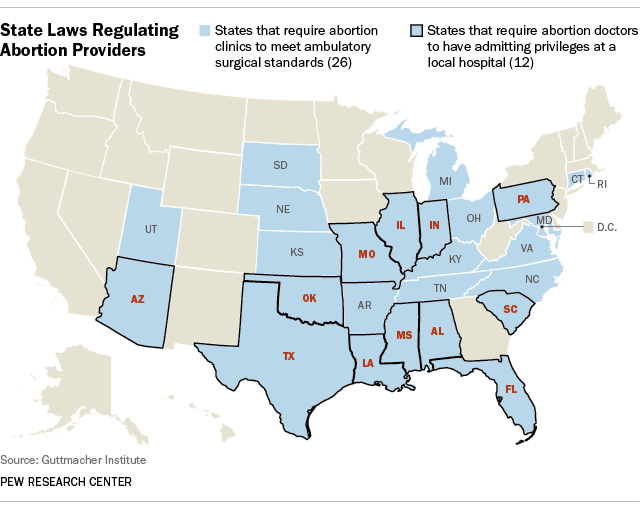 Passage of the new Texas law is part of a larger drive, mostly in states in the South and Midwest, to more strictly limit and regulate abortion. For example, in recent years, 12 states outside of Texas, including North Dakota and Arizona, have enacted laws banning abortion at 20 weeks or sooner. Another 11 states, including Wisconsin and Alabama, have enacted statutes requiring doctors who perform abortions to have hospital admitting privileges. But many of these new regulations have been challenged in court and subject to injunctions. For instance, in Wisconsin and Alabama, like Texas, the new admitting requirements have yet to be enforced due to court-ordered injunctions that are in place pending appeals. The legislative and legal battle in Texas attracted particular attention because it followed a much-publicized 11-hour filibuster by Texas State Sen. Wendy Davis that initially stymied passage of the measure. Davis now plans to run for governor. The statute, which was enacted in July, would require doctors at abortion clinics to have admitting privileges at a nearby hospital and require clinics to meet health standards consistent with surgical operating centers. These provisions were struck down by the judge, who ruled that they would force many of the state’s clinics to shut down and therefore would unreasonably restrict women’s access to abortions. The court did uphold another provision of the law, requiring abortion doctors to follow certain federal protocols when administering abortion-inducing drugs. This provision, as well as a ban on most abortions after 20 weeks of pregnancy (which was not challenged), will take effect as scheduled today. Residents of Texas and the seven other South Central states are the most opposed to abortion in the country, with 52% saying that the practice should be illegal in all or most cases, according to aggregated data taken from Pew Research Center polls in 2012 and 2013. By contrast, in the six New England states, only 20% say that abortion should be illegal in all or most cases. Overall, a majority of Americans favor abortion rights, with 54% saying it should be legal in all or most cases and 40% stating that it should be illegal in all or most cases. Abortion-rights supporters contend that the new clinic requirements enacted in Texas and elsewhere are a thinly veiled attempt to limit and ultimately outlaw abortion under the guise of protecting women’s health. But abortion opponents say there is a need for tighter regulation and point to revelations about Philadelphia abortion-provider Kermit Gosnell, who was convicted earlier this year of three counts of murder as well as 21 counts of illegally conducting abortions past Pennsylvania’s 24-week limit.